Confused about how to write an eye-catching resume? Still using the same old template, but want to upgrade it? If the answer is “Yes” for one of these questions, this blog post will help you to stand out with your resume and get noticed by potential clients. In addition, you can download free beautiful resume templates for a freelance translator and a checklist for resume optimization below the article. Templates look professionally and are easily customizable. Unlike CV, professional resume includes a brief description of your work experience on one-two pages. It is important to keep your resume short yet informative as recruiters/clients spend less than 30 seconds to decide whether to choose your services or not. Therefore, your resume shall provide only relevant information, interesting for your potential client. 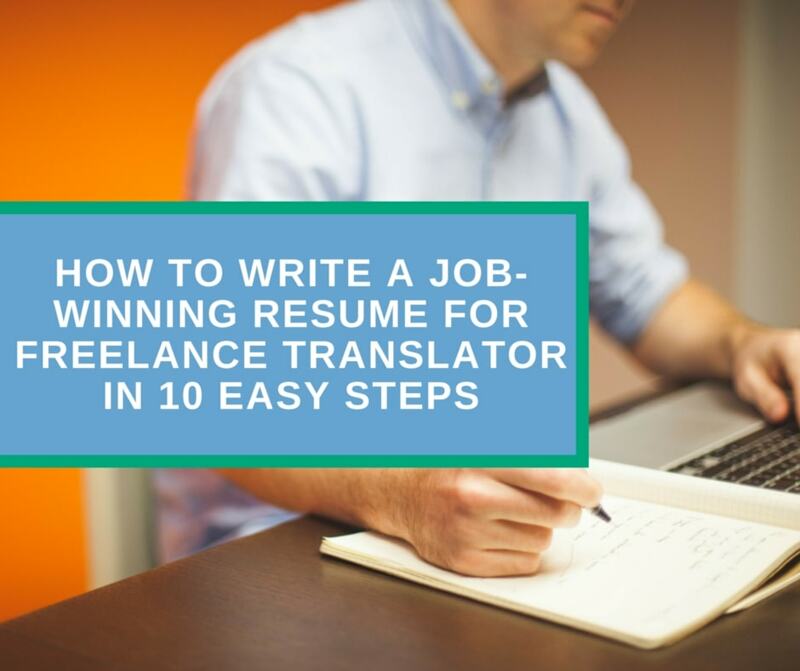 Well, let’s learn how to write a job-winning resume for freelance translator in 10 easy steps! Introduce yourself in a couple of words. Say who you are, what you do and how you can help clients to meet their translation needs. This information shall be placed on the foreground, preferably in the header section, so that your resume can be easily found and selected for a particular project. If you work in several language pairs, mention the strongest one first. You should also remember that clients, translation agencies, in particular, prefer to assign projects to the native speakers of a target language. For instance, my native language is Russian. Therefore, I indicate English-Russian language pair as the primary one. Most probably, the second point of your resume that will capture the attention of a potential client is your fields of specialization. Searching for a translator in the database, translation agencies use keywords and other search tools. Listing your areas of specialization will double the chances of being selected from the database. You may include both generic topics, like Technical, Medical, Finance, Legal translation, etc., and more specific fields of expertise. For example, in my case, they are mechanical engineering, civil engineering, power supply, and geological exploration. You may also include the topics of your interest, i.e. you don’t have experience in website localization, but would like to work in this field. If you have just graduated from university and don’t have much experience, put emphasis on your educational achievements. If you have worked in the translation industry for some time, place information about your work experience in a reverse chronological order. Each item of this list shall include company name, years of work, position, duties and/or projects. In this case, information about education shall be placed at the end of the resume. If you don’t know anything about CAT tools yet, read this article. Remember, CAT tools are not the same as machine translation. CAT tools are only instruments helping to improve translation speed and consistency. If you have experience working in SDL Trados, MemoQ, Across or analogous software, you should definitely include this information in your resume. Feel free to mention other related tools like PoEdit, Passolo, InDesign, Photoshop, etc. This can be a real advantage when choosing you as a translation service provider. Remember to proofread your resume to eliminate any possible typos, grammar, punctuation, and stylistics mistakes. Resume is an important translator’s tool. Mistakes can raise doubts about your professionalism. Properly selected photo helps to personalize your resume. Never use casual photos from home parties or last year trip to Goa. A resume is not your Facebook page. You should also avoid using overly formal photos, like a photo from you driving license or ID card. Choose the golden mean! Professional photo on a light background will show your potential clients that you’re a serious, responsible person. Make sure that you included the valid email address, telephone numbers (landline and/or mobile), Skype ID, and other data, for instance, your website URL if you have one. Actually, professional freelancer shall have a website, but I will consider this topic in a separate article. PDF files look professionally, moreover, they can be viewed on almost any platform, whether you have Windows or Maс, iOS or Android. All fonts and formatting will remain unchanged. In addition, this will show that you can work with PDF format. Use your full name and language pair as a resume file name. Avoid random numbers, “new file”, “resume” or just “translator”. Remember that your resume shall not only be outstanding but speak for you. I would recommend the following file name format for your resume: “full_name_language_pair_translator/interpreter”. Finally, keep your resume updated. Running a freelance business, you will definitely obtain new knowledge and skills that can add value to your resume.